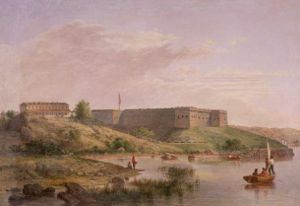 Fort Trumbull (1777-1910) - First built as a First System coastal fort established in 1777 at New London, New London County, Connecticut. Named after then Govenor Jonathan Trumbull. Turned over to the Treasury Department in 1910. 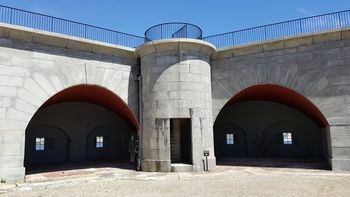 Fort Trumbull Casemates and Enclosed Spiral Staircase. Fort Trumbull Land Side Ravelin. Fort Trumbull by Seth Eastman. The First System fort was built between 1775 and 1777 as an earth and stone fortification completely exposed from the land side. Benedict Arnold and a British fleet easily captured Fort Trumbull in September 1781 during the Revolutionary War. 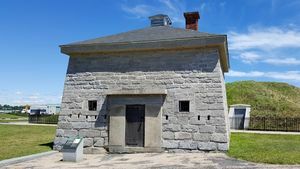 Fort Trumbull 2nd System Blockhouse. In 1812 the old First System fort was leveled and replaced with a much stronger Second System fortification with land side protection. This new fort was able to keep the British Fleet offshore for the remainder of the War of 1812. This fort deteriorated after the war and was torn down in 1839 to make way for a new Third System fort. The new Third System fortification was built between 1839 and 1852 as a five-sided, four-bastion coastal defense fort. 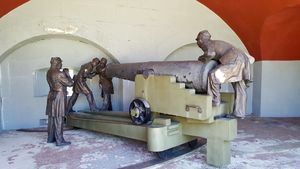 The fort was built under the supervision of Army engineer George W. Cullum, (Cullum 709), who later served as superintendent of the United States Military Academy. Fort Trumbull 1860s Casemate Gun and Crew. 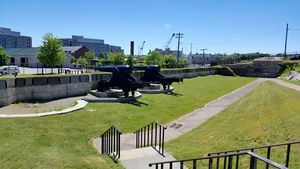 During the U.S. Civil War Fort Trumbull served as a recruiting and training depot and as headquarters for the 14th U.S. Infantry. 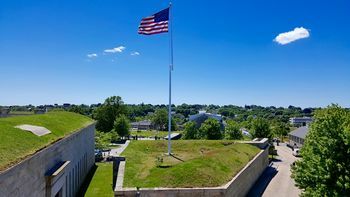 Fort Trumbull was designated as a subpost of Fort H.G. Wright on 31 Mar 1906 and later served as the headquarters of the Long Island Sound Endicott Period coastal defenses until it was turned over to the Treasury Department on 15 Oct 1910. The Treasury Department used the post first as an academy for their Revenue Cutter Service and then as the Coast Guard Academy (1915-1932). Fort Trumbull became the Merchant Marine Officers Training School (1939–1946). After the war Fort Trumbull became the site of the Naval Underwater Sound Laboratory (1950 to 1990). The post has been operated as a state park since 2000. Fort Trumbull Visitor's Center in the 1830s Officer Quarters. Must See! Part of Fort Trumbull State Park, New London, New London County, Connecticut. 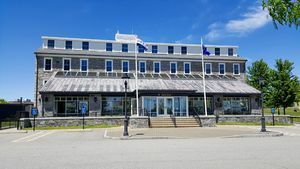 Excellent visitor's center built in the 1830s Officer's quarters. 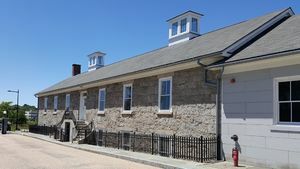 Location: Fort Trumbull State Park, New London, New London County, Connecticut. This page was last modified 19:45, 7 January 2019 by John Stanton.